Did you know that one of the most stressful aspects of living in modern life is dealing with the problems that arise after an auto accident? Were you also aware that some auto accident injuries are hidden and are seldom detected for months or even years? As a result, two things can occur when an injury is not taken care of properly, or the accident victims settle their case with the insurance companies before getting evaluated from a Physician trained in soft tissue injuries. ... This Could Be A Big Mistake. It is not the responsibility of the insurance company to pay for anything more than that. They are not responsible for pre-existing injuries; only the injuries sustained from the accident. Even if you are just sore, you should get checked out immediately because you may experience pain, numbness, headaches, muscle stiffness, fatigue, and other problems that can lead to osteoarthritis and other degenerative conditions months and years down the road. Remember, nothing is more important than your health, especially when you start to lose it. Not only are auto accidents an inconvenience and a hassle, a common redundant complaint of auto accident victims is that they don't feel like their normal selves. You may also be experiencing obvious pains and symptoms like muscle stiffness or spasm, neck pain, headaches, numbness and tingling, back pain, difficulty sleeping, irritability, memory loss, fatigue, difficulty concentrating and many other difficulties. Or worse than that, you may be injured and feel nothing at all. 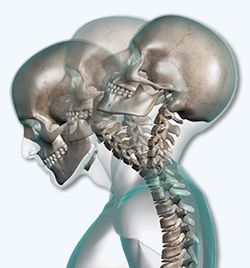 Studies involving live humans have demonstrated that a motor vehicle accident of as little as 5 mph can induce cervical (neck) injury. However, other studies have shown that cars can often withstand crashes of 10 mph or more without sustaining damage. Many studies have found a significant number of individuals to be symptomatic for many months and even years after a motor vehicle accident. In one such study, 75 percent of individuals remained symptomatic 6 months after the accident. Another study, published in the European Spine Journal, found that during the period of time between the first and second years following a motor vehicle accident over 20 percent actually had their symptoms. If you have been in an auto accident, you need a physician who is trained in the biomechanics of the human body; someone who treats these injuries every day. In addition x-rays or MRIs should be taken to find out if there has been any structural damage. In our office, we evaluate auto accident victims and make any appropriate referrals to other health care providers such as radiologist, orthopedic surgeons, physical therapist, and massage therapist if needed. We also offer attorney referrals if necessary to help your case. · Our primary responsibility is giving you the care you need, and submitting the required documentation to the insurance company so your rights are protected. If we can't help you, we will refer you to a provider or facility that can. A team approach to a traumatic injury is usually better for an individual who has suffered moderate to severe trauma such as an auto accident. · According to the Insurance Research Council, nearly 1/3 of all claimants injured in motor vehicle accidents (MVA's) seek treatment from doctors of chiropractic. This is an impressive number given that the National Safety Council (NSC) has determined there to be more than 12 million MVA's annually involving more than 20 million vehicles. · The reason individuals choose chiropractic care for treatment of injuries sustained in MVA's is simple - chiropractic care is exceptional in the treatment of soft tissue injuries, especially of the spine. Since the most common injuries associated with MVA's are sprains and strains of the spinal muscles and ligaments, it's only natural that chiropractic be the treatment of choice. · Numerous studies have also found individuals injured in MVA's prefer chiropractic care for the treatment of their injuries. One such study evaluated 190 whiplash injury victims and found those who received chiropractic care reported treatment satisfaction of 100%. There are numerous advances in chiropractic techniques and a chiropractor's education. We can tailor our care to your specific needs without all the pops and cracks associated with some of the older chiropractic techniques.